In nahuatl—the language of the Aztecs—obsidian was know as itztli, which meant “divine stone”. It has been considered the world over as an incredibly valuable stone, not just because of its beauty but also because of its usefulness as a tool and weapon. Indeed obsidian makes one of the sharpest blades known to man so that even to this day, obsidian scalpels are coveted as the finest surgical blades. Obsidian is not a mineral, but a mineraloid. It is more closely related with glass, and is formed, much like glass, by the rapid cooling of viscous, silica-rich lava. The liquid hot magma cools so fast that the molecules don’t have time to arrange themselves in a crystallized structure, as with most other stones. This is what allows obsidian to fracture with nearly molecule-thin edges. This unique characteristic gave obsidian a very high importance in all aspects of Mesoamerican culture. Its use throughout the profane and sacred worlds was ubiquitous. It was shaped as knives, arrow heads, scalpels and scrapers, as well as body ornaments and art of all kinds. Every part of society used obsidian items, from the farmer in the field, to the high priest, from the cook in the kitchen to the great warrior. 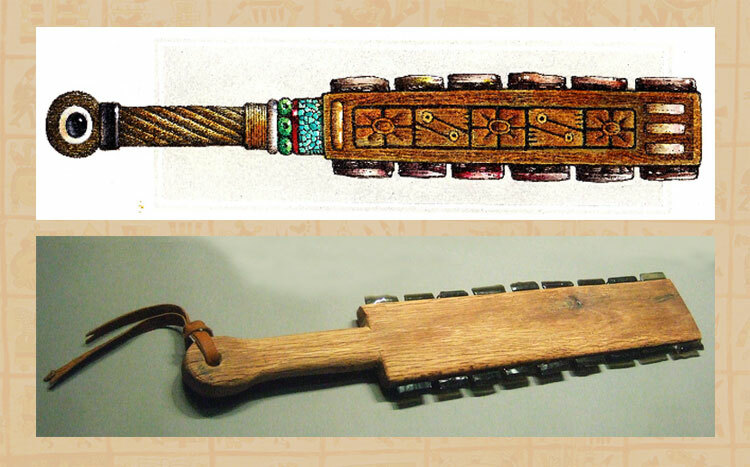 The macuahuitl—a mighty weapon made from a heavy wooden paddle embedded with obsidian blades—was known by the Spaniards to have cut off a horse’s head in one slice. Conan the Barbarian eat your heart out. Obsidian is found all over the world and all over Mexico. Gem & Jade’s obsidian comes from two areas: the third largest known deposit on the planet, which is located around the Tequila mountains just outside of Guadalajara; and in the municipalities of Otumba and Pachuca in the State of Mexico—located just a few kilometers from the ancient site of Teotihuacan. Rough obsidian looks like glass where it’s been broken. The mines in this area bore much of the raw material used by the ancient cultures of Mexico, including the Toltecs and Aztecs. The obsidian was especially valued from Pachuca, where the mine produces a high-purity stone with a brilliant green tone caused by the presence of copper. These green stones were highly valued and reserved for use by the priests and high classes. There are many colors of obsidian. As with all other stones, colors mean there are impurities in the chemical make-up of the mineral, therefore black obsidian can be considered the purest. But pure is often boring, and it is obsidian’s imperfections that bring it to the level of art and jewelry. Inclusions of different elements such as rubidium, lanthanum, and even regular old iron, dance with trapped gas bubbles and light to cause a literal rainbow of iridescent colors, including blue, gray, red, brown, green, gold, silver, and a mixture of all of them, which is aptly deemed “rainbow obsidian”. A Virgin of Guadalupe in rainbow obsidian. Black obsidian is a powerful grounding stone, and is said to absorb negative energy and help you activate your instinctual root chakra. Black obsidian has been used in an esoteric sense as well, through scrying and divination. The different colors have different energetic uses. Rainbow obsidian brings love and happiness to life and relationships. Gold obsidian is for joy and fulfillment. Silver obsidian is for clarity and insight.